Whew. Today’s media world is noisy. But when you write blog copy (or any other kind of copy), you absolutely must write a compelling headline to earn your readers' attention. And then an even tougher challenge follows: You have to keep your reader’s attention. Think about how often you yourself stay tuned, from the first line to the last line of an email, article, blog post, ebook, research report or any type of content. If you were to examine your online reading habits, you’d likely discover that you start reading far more pieces than you finish. The cold hard truth is, readers get bored fast. And bored readers bail. So, following is a list of boredom busters to help you keep your readers engaged. 1. Write about your reader. Content marketers sometimes struggle to determine what to write about. Let me make it easy: Write about your readers. Help them overcome challenges. The key to keeping readers interested is writing about what they’re interested in. And they’re interested in themselves. Your readers want to improve. Tell them how. Though this is the most common of all copywriting tips, it remains the most ignored. Focus on your reader -- not your brand. Most marketing copy reads like, well, marketing copy. It shouldn’t. Everyone enjoys a fun conversation and no one likes being marketed to. Are you still clinging to the notion that your niche is the exception? If you remain dead serious, don’t be surprised when readers get bored and bail. Every one of us is selective about what we read, and we choose to read material that moves us. So, lighten up. Tell a little story. Ask questions. Introduce characters readers can relate to. Speak to their memories, values and dreams. Use your sense of humor. 3. Give your writing rhythm. Your copy not only needs heart, it needs a heartbeat. Give it rhythm. 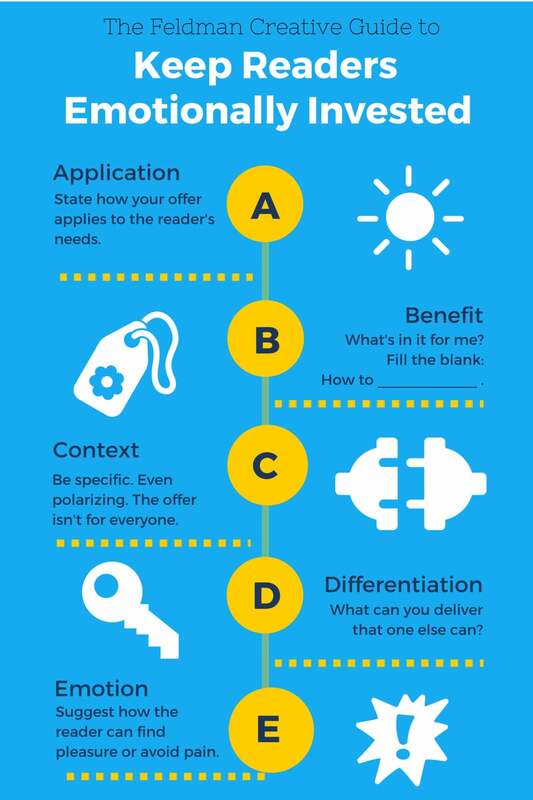 Making your first paragraph brief will help get readers into the page. Avoid long paragraphs. Use a lot of paragraph breaks. When you write a long sentence, follow it with a short one. The goal is to keep readers engaged and their eyes moving. Your copy stops working when it feels like work to read. Find ways to break it up. Change the pace, with skim-friendly elements, including subheads, bullet lists, photos with captions and pullout quotes. Challenge yourself relentlessly as you compose your copy, by asking “why?” Why are you telling this story or delivering this lesson? Why are you, the writer, someone to trust on this topic? Why should your readers care? The “why, why, why” routine helps squeeze a meaningful selling proposition out of your mind and onto the page. You won’t lose sight of what your readers aim to achieve, and your writing will better articulate how your offer applies to the readers' needs. I love this exercise because you can’t put a feature in the blank. For example: "How to achieve a longer battery life." Makes no sense, right? But this version does: "How to be confident your device won’t let you down when you need it." Put yourself in your reader’s shoes. Don’t be afraid to be specific or even polarizing. Disqualification is powerful, too. I recommend treating your offer as a "cause." With a cause in mind, you'll find that your copy will rally the right people and repel the wrong ones. However rationale we believe ourselves to be, ultimately all decisions are driven by emotions. Your readers take action to avoid pain or seek pleasure. So, identify the emotional needs your customers have and use powerful words to tap into those needs.